Although Africa has long been known to be rich in oil, extracting it hadn't seemed worth the effort and risk until recently. But with the price of Middle Eastern crude oil skyrocketing and advancing technology making reserves easier to tap, the region has become the scene of a competition between major powers that recalls the nineteenth-century scramble for colonization there. Already the United States imports more of its oil from Africa than from Saudi Arabia, and China, too, looks to the continent for its energy security. What does this giddy new oil boom mean -- for America, for the world, for Africans themselves? 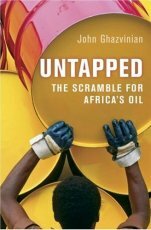 To find out, John Ghazvinian traveled through twelve African countries -- from Sudan to Congo to Angola -- talking to warlords, industry executives, bandits, activists, priests, missionaries, oil-rig workers, scientists, and ordinary people whose lives have been transformed -- not necessarily for the better -- by the riches beneath their feet. The result is a high-octane narrative that reveals the challenges, obstacles, reasons for despair, and reasons for hope emerging from the world's newest energy hot spot.